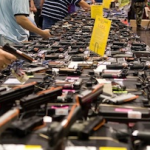 From Mediaite: After two mass shootings last week, is it time for other countries to speak out about the American gun problem? Writes Mediaite, “Calling the United States a ‘country where people are better armed and only slightly less nervy than rebel fighters in Syria,’ on Saturday, Observer columnist Henry Porter called for an international intervention into the U.S.’s gun epidemic. ‘What if we no longer thought of this as just a problem for America and, instead, viewed it as an international humanitarian crisis—a quasi civil war, if you like, that calls for outside intervention?’ Porter mused. ‘As citizens of the world, perhaps we should demand an end to the unimaginable suffering of victims and their families—the maiming and killing of children—just as America does in every new civil conflict around the globe. '” Read on here. From Gossip Cop: Last night brought the 65th Annual Primetime Emmy Awards, and there were plenty of buzzworthy moments. 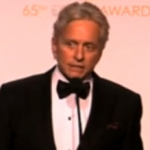 One occured backstage, Gossip Cop reports, “Michael Douglas questioned the U.S. prison system backstage at the Emmys on Sunday, elaborating on a shout-out to his incarcerated son Cameron during the actor’s earlier acceptance speech. Speaking with reporters, Douglas lamented that he’s been unable to visit Cameron, who’s currently in solitary confinement even though he was convicted for non-violent drug offenses. ‘Obviously at first, I was certainly disappointed with my son,’ said the star. ‘But I’ve reached a point now where I’m very, very disappointed with the system.’ He had more to say.” See video of the speech here. 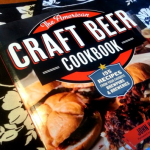 From Geekosystem: Are you a beer geek that loves to cook? Listen up! Writes Geekosystem, “Brewing beer is science, and breweries all over the country are stepping up their game as part of the craft beer movement. Saveur says the new American Craft Beer Cookbook by author John Holl was, “made for beer geeks.” It focuses on how craft beer can be paired with, and in many cases used in food, and the results are delicious. The cookbook has over 155 recipes for everything from brunch to dessert. Not all of the recipes use beer as an ingredient, but Holl suggests beers to pair with those that don’t. As a guy who has visited more than 900 breweries around the world, he knows what he’s talking about. We had the chance to speak to Holl about the book and his job as a beer journalist, which has us a little jealous — and we get to write about geek stuff all day. ” Read what he had to say here. From Styleite: The Emmys last night meant red carpet style for Styleite, who pointed out one disappointing trend while recapping the fashion of the evening: “We’re fully aware of the important role control briefs play on the red carpet. Sometimes people even wear multiple pairs at one time! And while we dig it when celebrities come forth and admit their enviable award show figures are not solely due to pilates and liquid dinners, there are ways to do this and ways to not do it. One of the ways to not do it is by wearing a dress that makes your underwear the focal point of your outfit. Julianne Hough and Lena Headey – we’re looking at you. At least we would be if we weren’t so distracted by your lower torsos. This is the Emmys, not the GQ Men of the Year Awards. Kristen Stewart, it’s with regret that we blame you for this trend.” See pictures of the worst looks here. 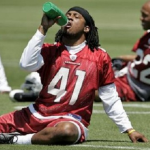 From SportsGrid: There was a gory and unusual injury in the Arizona Cardinals game yesterday. Writes SportsGrid, “Rashad Johnson was a ten-fingertipped safety for the Arizona Cardinals when he woke up on Sunday. Now he’s a nine-fingertipped safety for the Arizona Cardinals. What I’m trying to say is the dude lost his fingertip, and even though he found it, it’s not coming back to its home: ‘Arizona Cardinals safety Rashad Johnson said Monday that he lost the top of his left middle finger just above the knuckle during Sunday’s loss to the New Orleans Saints. Johnson realized the significance of the injury when he pulled his hand out of his glove and the fingertip was still in it.’ Technically he didn’t ‘lose’ it, because he found it.” Read what happened next here. From The Mary Sue: What’s next for the X-Men director? 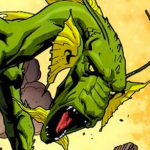 Answers The Mary Sue, “Ladies and gentlemen, Fin Fang Foom, who will certainly not be appearing in Syfy’s Bryan Singer helmed kaiju series, though he is a giant magic lizard from the Marvel universe that probably some X-Man has fought at, like, some point. He wears underpants. Also, thank you, Pacific Rim, for making it so that I feel like I can use the word kaiju without making it a link to a Wikipedia article. According to Deadline, Singer’s series will focus on the aftermath of a kaiju attack in a small Northern California community, and will go by the name Creature at Bay.” Read the story here. From The Jane Dough: Today, the site is asking you to reveal your sixth grade bookshelf. Ashley Perks begins, “I started reading before I turned three. At first there were picture books, of course, but as my skills grew, I moved on to old favorites like Berenstein Bears and Dr. Seuss rhymes. My mom encouraged my reading – sure, she was proud of it, but I secretly think it was also because when I was reading, that was a period of time where she didn’t have to watch me and she could go do grown-up things. So it’s no surprise that ‘Matilda’ was one of my favorite books when I was a kid. I mean, of course it was. 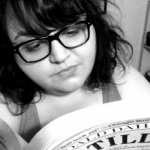 In my head, I was Matilda, minus the telekinetic powers. Occasionally when I was bored, I would stare really hard at an object, willing it to move just ONE CENTIMETER, because I was convinced that if I just tried hard enough, I was smart enough to move things too.” Read on here. From The Braiser: The Braiser is deeming the Emmy’s “Top Chef Prom.” Writes the site, “The boys of Top Chef were noticeably absent from the 65th Annual Primetime Emmy Awards Red Carpet last night, but Padma Lakshmiand Gail Simmons happily accepted the excuse to dress up. Even though we all knew Top Chef wasn’t going to win Outstanding Reality Competition (although, to be fair, none of us predicted them losing out to The Voice, either…really? ), Padma and Gail (and Gail’s baby bump) dutifully donned some designer dresses, got their hair and makeup done, and took a bunch of pictures anyway.” See those here.